Winter Patriot: Need A No-Work Job And $13,000 Per Month? Try The Air Force! Need A No-Work Job And $13,000 Per Month? Try The Air Force! He was between jobs, waiting to be confirmed for his new post, and he needed a paycheck. So the Air Force arranged one for him -- at a tax-exempt "charity" that mostly works for the US military. The Washington Post headline says it was a no-work contract, but that's not technically true. Charles Riechers did attend the company Christmas party. For two months, Riechers held the title of senior technical adviser and received about $13,400 a month at Commonwealth Research Institute, or CRI, a nonprofit firm in Johnstown, Pa., according to his resume. But during that time he actually worked for Sue C. Payton, assistant Air Force secretary for acquisition, on projects that had nothing to do with CRI, he said. "I really didn't do anything for CRI," said Riechers, now principal deputy assistant secretary for acquisition. "I got a paycheck from them." Riechers's job highlights the Pentagon's ties with Commonwealth Research and its corporate parent, which has in recent years received hundreds of millions of dollars worth of grants and contracts from the military, and more than $100 million in earmarks from lawmakers. Commonwealth Research and its parent company, Concurrent Technologies, are registered with the Internal Revenue Service as tax-exempt charities, even though their primary work is for the Pentagon and other government agencies. 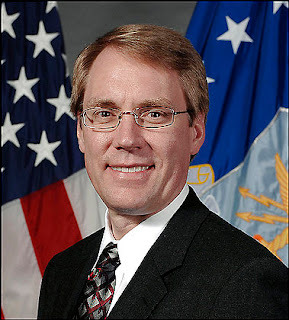 Specialists in federal contracting law said Commonwealth Research's arrangement with Riechers may have violated regulations governing how the Air Force is permitted to hire and use contractors, including a prohibition on certain uses of consultants to augment the federal workforce. The prohibition is designed in part to ensure that employees in sensitive government jobs serve the public and not corporate or other outside interests. "It's a seriously questionable arrangement to have him on the payroll not even pretending to do assigned and properly monitored work," said Charles Tiefer, a contracting law professor at the University of Baltimore Law School. "The principal deputy assistant secretary for acquisition and management should not be making himself into a glaring example of what not to do with acquisition and management." Riechers was paid a total of $26,788 as part of the contract to provide research to the Pentagon, CIA and other intelligence agencies. In a statement, Riechers said he had no problem accepting the pay because Commonwealth Research is a nonprofit organization "that had an established relationship" with the military service. Well there we are, then. Are you being paid $13,400 per month and not doing anything to earn it? That could be a problem; it might look "shady". But if you can justify the arrangement on the grounds that the company paying you is registered as a non-profit and it has "an established relationship" with the military service, you don't have anything to worry about. In November, Riechers was nominated to be a senior acquisition official, taking the title last held by Darleen A. Druyun. She was sent to prison in 2004 after she left the Air Force for negotiating a job with Boeing while she worked for the government and for favoring the company in several procurement decisions. Ah, Darlene Druyun. I remember her well. She spent billions of taxpayers' dollars at Boeing while the corporation was doing wonderful things for her family. Charles Riechers should suit her old job just fine. You can read more about his not-for-profit escapade here.